For all the serial whatsappers and facebook addicts, I believe many of you would have come across touching stories in your newsfeed that “will make you cry, leave you stunned, will make your day” where the husband/wife/friend/son/daughter realized they’re missing real conversations with real people because they’re staring at their phones all day. I bet you have liked and shared these stories too. And? Am I the only emotional nut taking forwards seriously? I once turned a vegetarian because I read a forwarded message on how foie gras was made. I couldn’t keep it up too long though because I couldn’t subsist on nothing. Our family was an exclusive non-vegetarian group then. But shortly after I gave up, my maamiyaar turned vegetarian and now we’re a very inclusive group. Timing. Not one of my strong points and never on my side. The little fella is missing for 20 minutes but everything is silent. They’re not fighting, nothing is broken, none of them have run up crying and the TV is not on. All of this can mean only one thing. So is the grandmother’s phone. Hasini and Yuvi are curled up on the bed with a smartphone each playing games and colouring pictures. Everybody is staring at a screen. No one to talk to. Not even little Yuvi. Best time to try something in the kitchen. Maybe some Mexican style rice. I rinse the rice and beans, heat up the oil, peel the onions and start chopping the garlic. At that point when I am committed, when I am more in than out, when the oil is hot and when I’ve just thrown in the garlic, Yuvi shouts out to me “Ammaaaaaaaaaaaa“. 1. Rinse rice well in 2-3 changes of water and soak for half an hour. 2. To a bowl add all ingredients called for under salsa and mix well. You may mash up the tomato a bit if you like that kind of consistency. Set aside. 3. To a thick bottomed pan, add oil and when hot add the cinnamon stick. When fragrant, add the chopped garlic. When the garlic turns golden around the edges, add the chopped onions and fry till they turn translucent. 4. Throw in the fresh red beans, green peas and slit green chillies stir fry for a minute. 5. 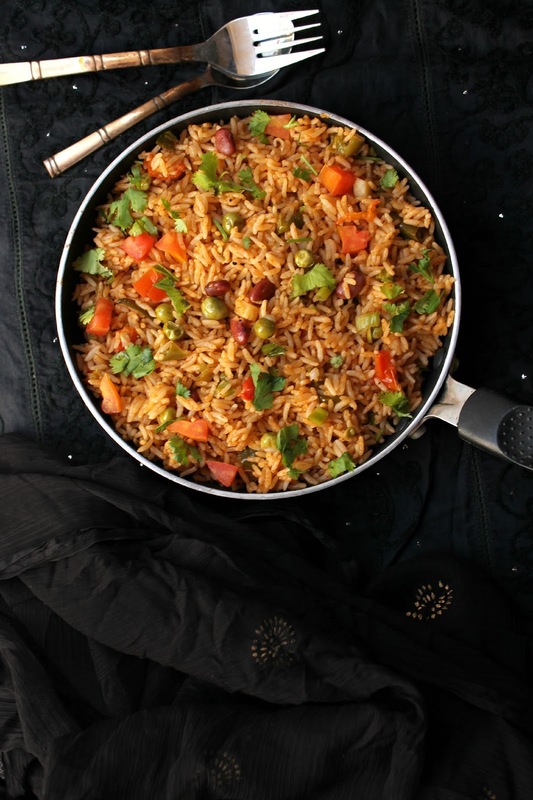 Drain the liquid, reserving it and tip the rice into the pan. Fry for 4-5 minutes or till rice is nicely roasted. 6. Pour in tomato puree and mix well. Pour in the reserved liquid up to about an inch above the rice level. Add salt. Mix well. Taste and adjust seasoning. 7. 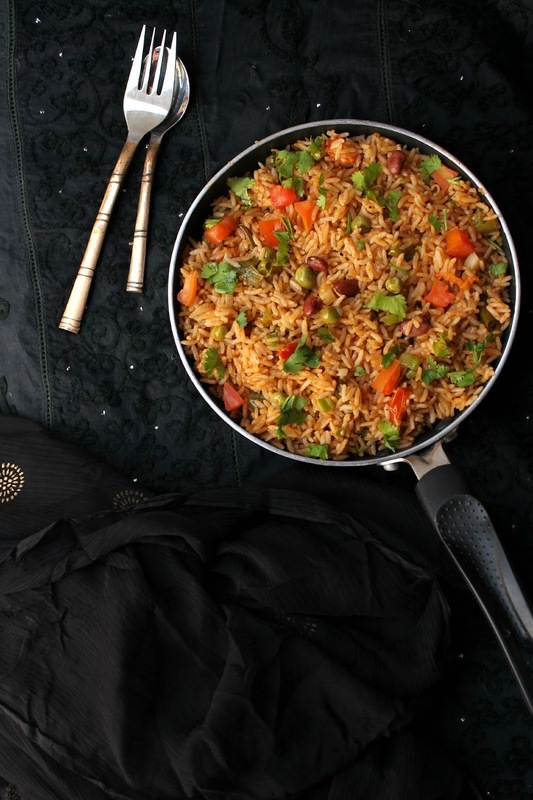 Close the pan with a tight fitting lid, turn heat down to low and cook for 12 minutes or until rice is tender. Open up, fluff up the rice with a fork. Tip in the salsa and gently mix it in with the rice. Serve hot. 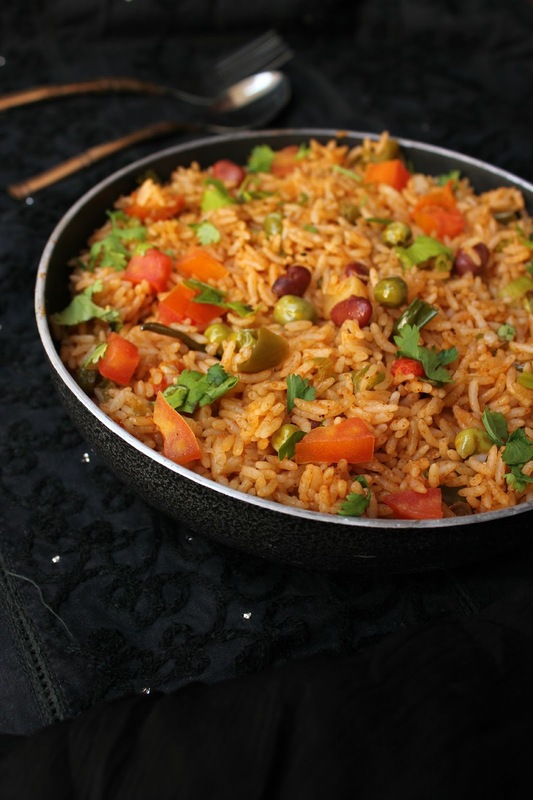 This entry was posted in One-pot dishes, Rice & Biryani and tagged mexican food, Mexican style rice, one pot rice dish, recipe, rice, rice dish, salsa on rice.